The three-month amnesty announced by the Qatari government for undocumented workers to leave the country without facing legal consequences begins today, but many questions remain unanswered. Qatar’s first grace period in 12 years, and only its third ever comes into force on September 1 and ends on December 1, 2016, according to the Ministry of Interior. The grace period for undocumented workers expires a few days before amendments to the country’s sponsorship law (Kafala) comes into effect. Foreigners who are ‘illegally’ residing in Qatar i.e. in violation of the provisions of Law No. 4 of 2009 Regulating the Entry, Exit, Residence and Sponsorship of Expatriates - can exit the country without legal consequences, the Ministry of Interior said on August 24 on its Facebook page and Twitter account. "Illegal residents should contact the Search and Follow up Department to complete the exit procedures during the grace period," it said. The announcement was initially made in English and Arabic, and later in nine other Asian languages. However, the Ministry of Interior has made no official statement to newspapers or other media, aside from its social media announcement. Strangely, there has been no official communication between the Ministry of Interior and the embassies according to officials at several missions of South Asian countries, who spoke to Migrant-Rights.org under the condition of anonymity. 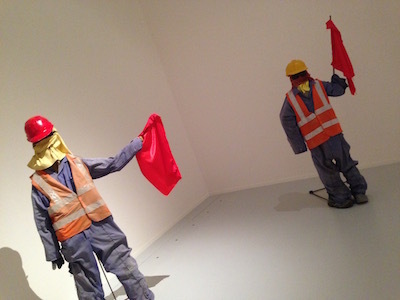 Qatari artist Khalifa Al Obaidly's installation depicts the invisibility of migrant workers. “We also got to know about the amnesty only through social media. There is no official communication between us and the Ministry of Interior, which is surprising. But we understand there has been a meeting between community leaders and officials at the Ministry of Interior,” remarked a senior official at the embassy of a South Asian country. “However, people who surrender will need temporary travel documents, which the embassies have to arrange and people call us asking details of the amnesty. They mainly ask us if they will be allowed to enter Qatar or will be blacklisted. We have no answers to such questions. We are able to provide them only with the information published on social media,” he said. Several expatriate organisations have come out to help their community members benefit from a three-month amnesty. These organizations mainly represent Indian and Sri Lankan communities who will be the focal point and help their compatriots gather requisite documentation before ‘surrendering’ to the Ministry of Interior. Workers continue to be baffled. One indvidual who contacted Migrant-Rights.org seeking clarifications, writes that the Philippines embassy was not able provide him clarity as they did not have enough information themselves. It remains unclear what action will be taken against an undocumented worker, particularly if the individual has an active dispute with the employer, a case in courts, or has a bank loan. Some legal experts predicted that people with court cases and bank loans will be allowed to leave the country unless they have a travel ban. According to another social media post by the Ministry of Interior on Tuesdays, an individual will require a valid passport or a travel document from the concerned authorities (embassies), an air ticket and ID card or copy of entry visa. The application will be received by the Search and Follow up Department at the Ministry of Interior between 2pm and 8pm, Sunday till Thursday from September 1, 2016 to December 1, 2016. However, the office will be closed during the week-long Eid Al Adha break in the second week of September. The Ministry requires either a valid passport or a travel document from the embassy. This is probably the easiest to furnish. Meanwhile, the chances of an undocumented individual possessing their entry visa or an identity card is slim. Furthermore, most of these workers live in abject poverty, making it difficult for them to purchase a one-way ticket on their own. The cheapest ticket to the Indian sub-continent hovers around US$150 to 200. The coming three months will test the generosity of communities, both in terms of money and time. It is illegal for expats to work in Qatar without a visa. And those who wish to change jobs must get a ‘NOC’ (No Objection Certificate) from their present employer. A migrant worker who leaves their employer or job without the employer’s consent is immediately deemed ‘illegal’ (‘runaway’ or ‘absconding’) as per the provisions of the Kafala. There is little recognition or consideration of the fact that the majority of workers are forced to ‘runaway’ due to non-payment of wages and/or abuse. These workers face the risk of arrest and deportation, and anyone who hires them without proper documentation faces fines and jail time. The law (No. 4 of 2009) states that any expatriate violating provisions related to the purpose of his entry or residency must leave the country in 90 days, or otherwise face imprisonment of up to three years and fines of up to QR50,000 or both for violation. In case of repeat violation, the punishment will be jail for not less than 15 days or fine of not less than QR20,000. Question also remains as to what action will be taken against sponsors responsible for workers remaining in the country without a valid visa, and what recourse would be available for workers who have not been paid their wages. The last amnesty took place between March 21 and June 20 in 2004. According to media reports, about 10,000 expatriates sought amnesty, the majority of whom were Nepalese, Indians and Pakistanis. There were some days when 200 or more people approached the authorities for assistance to leave the country. Nepalese formed the single largest group. More workers reportedly returned home when the grace period was extended by one month to July 20, 2004. Most were either Asian or Arab expatriates. As per media reports, the government had allowed illegal residents who voluntarily surrendered and left the country to return two years after their exit. In the last decade the UAE (2007, 2012), Saudi Arabia (2013), Kuwait (2011), Oman (2015) and Bahrain (2010, 2015) have all announced amnesties, with the average duration ranging between three to six months. All of these amnesties included some options for undocumented workers to regularise their status. This is not something Qatar has announced as yet. The Saudi amnesty was by far the largest, with nearly 5 million workers seeking redressal in 2013. While amnesties are announced as prized schemes, Gulf governments regularly crackdown on ‘illegal’ migrants without long overdue investigations into the practices that coerce or force so many migrants to become undocumented in the first place.